The 2018 Toyota Yaris brings a bold new design to your driving experience. As a subcompact car, the Yaris is built to be efficient. That means you get seating for up to five people, but you can still fit into tight parking spots. The vibrant exterior is complemented by eight color options, and an affordable price tag is bound to make any driver happy. Nothing quite compares to the Toyota Yaris. The 2018 Toyota Yaris comes in five trims: 3-Door L, 3-Door LE, 5-Door L, 5-Door LE, and 5-Door SE. The 2018 Toyota Yaris is helping to make driving better than ever with a few innovative features. For example, you can choose between a three-door or five-door design—both of which are European inspired for sporty appeal. The fuel-sipping engine easily get up to 35 highway mpg*, while features like Brake Assist and Smart Stop Technology keep you protected behind the wheel. Learn to love driving like never before in the Yaris. 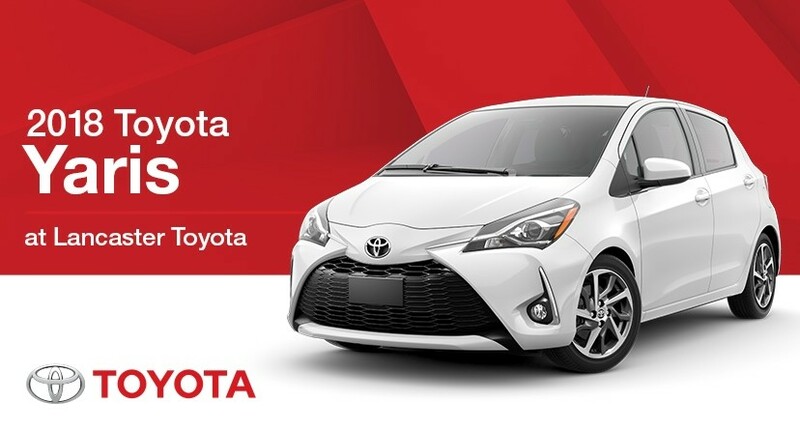 Test drive the Toyota Yaris at Lancaster Toyota today.